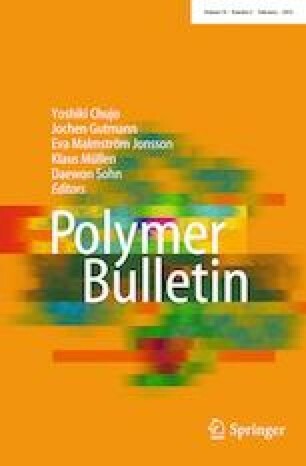 To improve the thermal stability and mechanical properties of poly(lactic acid) (PLA), bis(tert-butyl dioxy isopropyl) benzene (BIBP) (0–0.4 wt%) as cross-linking agent was introduced into the PLA. The PLA/BIBPx samples were characterized by Fourier transform infrared spectrometry. The gel fraction and degree of swelling of PLA/BIBPx were studied. The thermal and degradation properties of samples were also investigated by means of differential scanning calorimetry and thermogravimetric analysis; the thermal stability of the samples was improved by the addition of BIBP. The complex viscosity (η*), storage modulus (G′), and loss modulus (G′′) were increased with the increase in BIBP content from rheological measurement. The mechanical properties of the PLA/BIBPx blends and PLA/BIBPx films were tested by tensile tests, and the blends’ tensile strength was enhanced due to the cross-linking effect of BIBP. The 0.2 wt% BIBP gave the PLA/BIBPx blends the best mechanical properties, while the 0.1% BIBP made PLA/BIBPx films an optimal mechanical property. The morphology of the tear-fractured surface of the films was also studied, and PLA/BIBP0.1 film revealed more clearly layered structure than PLA. This work was supported by the fund of Science and Technology Bureau of Jilin Province of China (No. 20160307001GX), Science and Technology Bureau of Changchun City of China (No. 16SS03), Science and Technology Bureau of Jilin City of China (No. 20163206), and Chinese Science Academy (Changchun Branch) (No. 2017SYHZ0016).